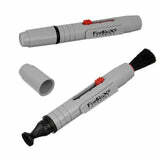 The Fotodiox Lens Cleaning Pen with Built-in Cleaning Spray is a great accessory for any optics user, making it great for maintaining your digital or film camera lenses, binoculars, scopes, night vision goggles and other sport optical devices. Safe for use on all optical lenses and compact digital camera lenses. The soft retractable brush removes dust and other debris that may compromise your lens. The small, pen-style design easily fits in any camera bag. To remove dust, hair and other particles, use the retractable brush to gently brush them off the lens as needed. If there are any fingerprints or smudges use the built-in spray and a cleaning cloth (not included) to gently remove them from the lens.